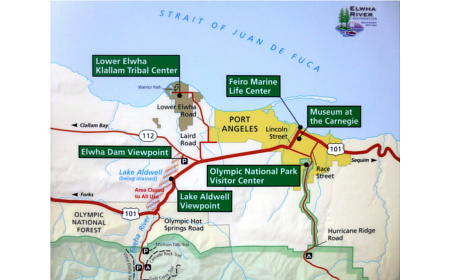 Where the mountains meet the sea, the North Olympic Peninsula is home to many significant and storied watersheds including the Elwha, Dungeness and Pysht, to name just a few. 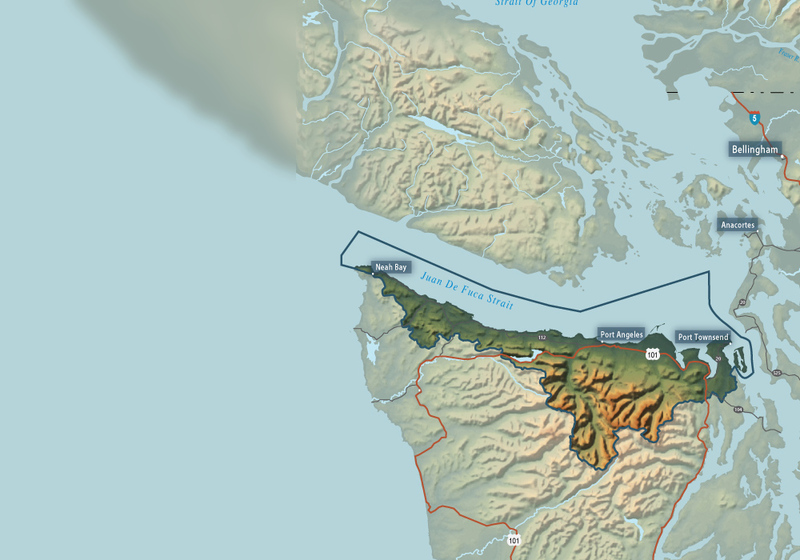 Stretching from Blyn near Sequim on Clallam County's eastern edge along the Strait of Juan de Fuca west to Cape Flattery at Neah Bay, this jewel of a Peninsula with its large timbers and mountain -fed rivers is a wonder to behold. Click to visit Yelp (or Check your Yelp App) for more local dining establishments and accommodations. 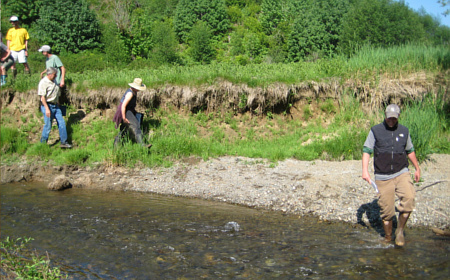 North Olympic Land Trust, talking about their work to protect this key floodplain along the majestic Pysht River. 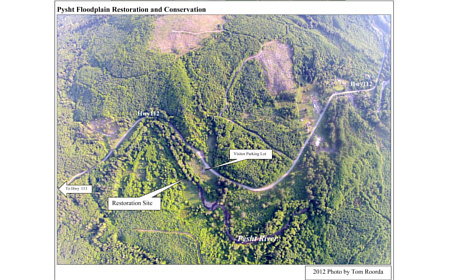 This aerial shows the Pysht Floodplain Restoration area near Clallam Bay-Sekiu which is open for the public to enjoy a walk along the river and a picnic lunch. Photo Credit to Tom Roorda, Graphics by Robert Knapp. 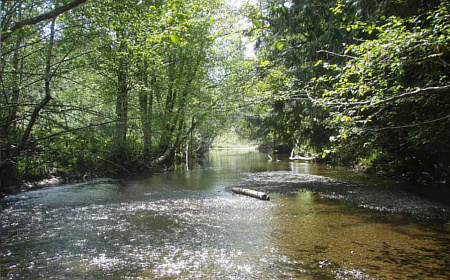 The Pysht is a 16 mile scenic river which flows into the Strait of Juan de Fuca and supports chinook salmon, coastal cutthroat trout, coho, chum and steelhead. 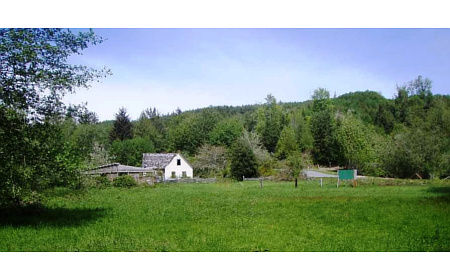 An uninhabited house located in the Pysht floodplain was purchased with funding from the WA Salmon Recovery Funding Board and removed so the river has room to move. 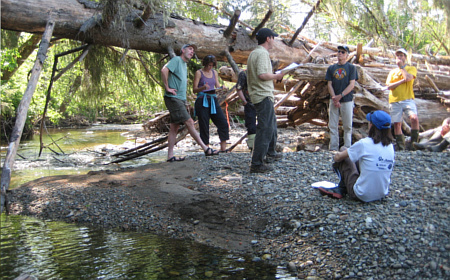 The North Olympic Lead Entity for Salmon and the WA Salmon Recovery Funding Board Review Panel learn more about the Pysht near a logjam which provides fish habitat. Photo Credit to: N. Olympic Lead Entity for Salmon. For the address of and directions to this project, click the green icon on the Google Map above. 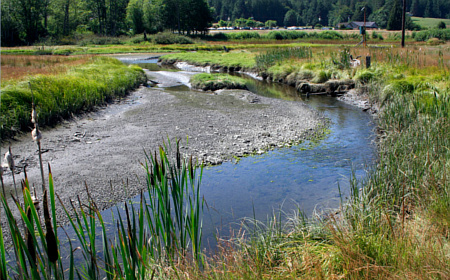 This video shows the restored Jimmycomelately estuary and features Hansi Hals, of the Jamestown S'Klallam Tribe which led this large-scale, successful effort to help restore salmon habitat. An aerial view shows Jimmycomelately stream nestled in between Sequim Bay and Discovery Bay outside Port Townsend. 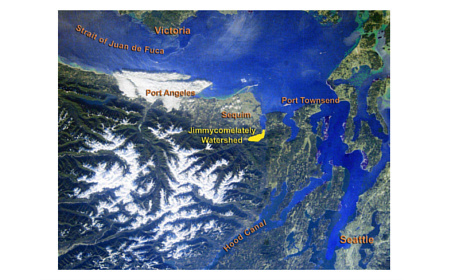 Jimmycomelately is the largest stream in the Sequim Bay watershed. A blue heron grazes at the water's edge. 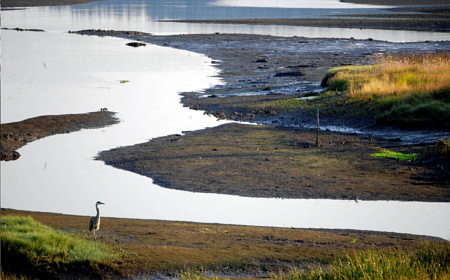 The restoration has supported increased returns of endangered summer chum salmon and native birds are abundant in the marsh. Photo Credit to: Randy Johnson. The creek was moved back into its historic channel and reconnected with the estuary. Removal of roads, new Highway 101 bridge construction, and native plant re-vegetation also occurred. Photo Credit to: Randy Johnson. 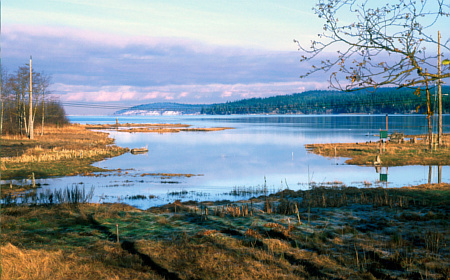 Sun bathes the estuary and illuminates the restored habitat which enables the estuary to function as intended: nature's nursery and banquet feeding area for juvenile summer chum salmon. Photo Credit to: Randy Johnson. 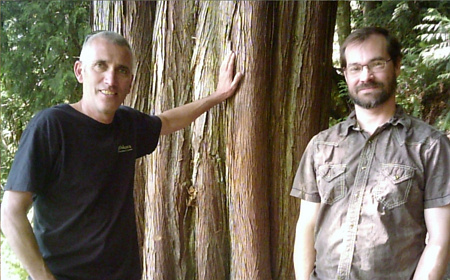 Olympic National Park's Josh Chenoweth and Elwha Klallam Tribe's Mike McHenry describe their work restoring the Elwha River watershed to recover the famed Elwha Chinook salmon. 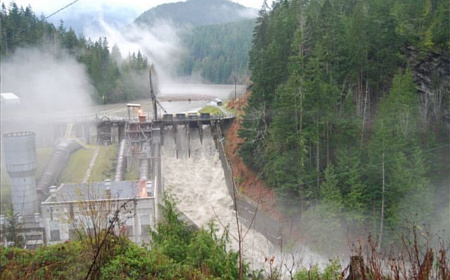 Construction began in 1910 of the 105-foot Elwha Dam which provided power for Port Angeles. 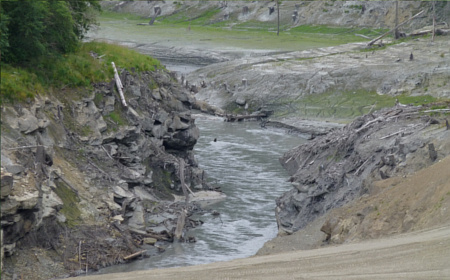 It was constructed without fish ladders even though state law required such. 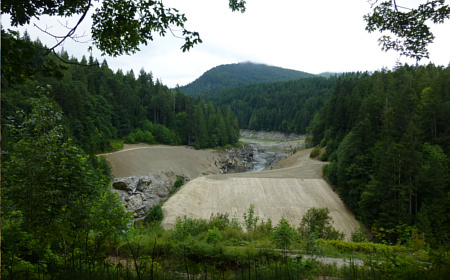 The view from the public vantage point after removal of the Elwha dam. The foreground is where revegetation of the newly exposed former Aldwell reservoir is beginning to occur. Photo Credit to: N. Olympic Lead Entity for Salmono. Copyright © 2019 Skagit Watershed Council. All rights reserved.